LPL Financial is one of the leading financial services companies and the largest independent broker/dealer in the nation*. For more than four decades, the firm has served as an enabling partner, supporting financial advisors in their pursuit of protecting and growing their clients’ wealth. A chief objective of LPL Financial is to reduce the complexity of running a financial services practice so advisors can focus on what they do best -- helping their clients attain their financial goals and fulfill their dreams. 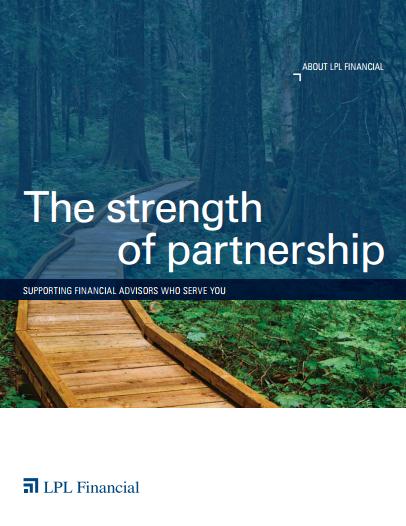 Thousands of financial advisors nationwide rely on LPL Financial to help meet their clients’ financial needs. They do so by using the firm’s tools and resources that help them discover their clients’ priorities, dreams, and passions; analyze and develop financial plans that support every stage of their clients’ lives; and make recommendations that put clients on the path to pursuing their goals.